I kept my One Monthly Goal (OMG) simple this month, knowing I would be traveling to two retreats and then caring for my husband after cataract surgery. While my OMG included the RSC colors of orange and gold, I needed some mindless sewing to fill my time between doctor visits and eye drop administration so I set about making a few string blocks. More on this one next month. Linking up with Heidi at Red Letter Quilts and Angela at soscrappy. ... along with me about a dozen or so years ago. The reason I named it Pumpkin Grins is because of the back fabric which is grinning pumpkins. I did not realize they glowed until one night at a quilt retreat when I entered my darkened bunk room and saw grins glowing from my bed! The pattern is Mystery Sampler from M'Liss Rae Hawley's 1999 book Fat Quarter Quilts. The quilts in this book use FQ packs of 6 fabrics with an added background fabric. I had been gifted a FQ pack of Halloween fabrics and this seemed an ideal way to use them up. What I like about this particular pattern is the variety of setting options. I used one of the examples in the book as my starting point, but I can see I made a few changes to accommodate the blocks I was able to make with what I had on hand. As the seasons change, I try to switch out the quilts on my MIL's bed so that she (perhaps) can get a sense of the progression of time. She seems to get the most pleasure from the fall quilt I will bring out next week. That one has a variety of blocks I received in a group exchange and in the past she has enjoyed examining each one. I fear this year she will be past noticing. SEW, my thought process this week moved to making another Mystery Sampler. This time I'm using some Christmas panels for the focus blocks and an assortment of red, green, and black fabrics mixed with a gray background that coordinates with the panels. Hoping to get the blocks done this weekend, then I'll try to find time to come up with an attractive layout. My husband's first cataract surgery went well, without incident. Thanks to all who expressed their concern and offered up prayers. We go back Friday to get measured for the second lens with surgery scheduled for Monday (and another round of post-op visits). Needless to say, my week has been occupied with being the designated driver and eye-drop-instiller. I've tried to fit in a few moments of sewing here and there. I managed to make the star units and assemble another row for Scrumptious III. The colors in Scrumptious inspired me to purchase this fun diagonal plaid at Tennessee Quilts last Thursday. And that, in turn, inspired me to dig out the teal Christmas panels. I doubt that I will do anything with them this year, though. I still need to make some broken dishes blocks for Scrumptious III and make a decision about borders. I've been collecting reds and grays for a Christmas quilt and I think this should be easy to get ready this year. The panels are so cute. I will have to modify the pattern to fit the larger size of the panels, but it should be easy to work out. More in the next post. For me, there is very little that refreshes more than observing the world from a mountain top, especially in the fall with the leaves turning color. 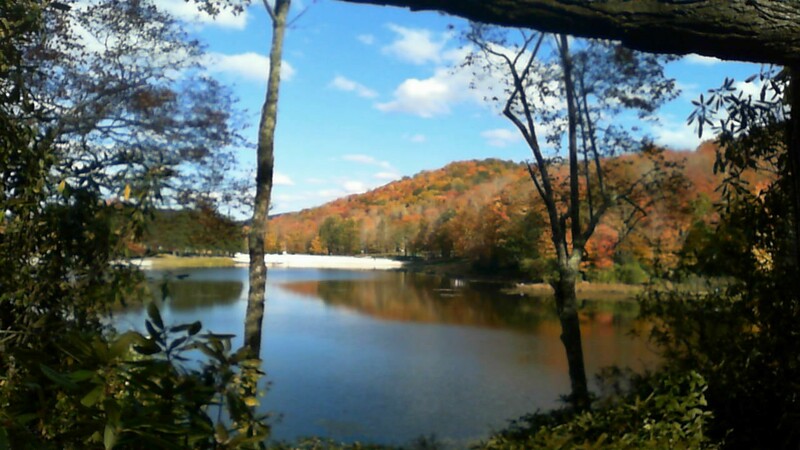 Last Sunday I motored up to the Holston Presbytery Camp and Retreat Center in Banner Elk, NC for four days of sewing, eating, and fun at Mountain Quilt Camp. Our hostess was Cath Evans from High Country Quilt Shop in Butler, TN. This was a new adventure for me, having heard about it from another blogger -- Joy at The Joyful Quilter. Check her blog for a full account of our first Mountain Quilt Camp. Though I've been to numerous quilting retreats, this was the first time I've walked in "cold turkey," so to speak. I was assigned to a bright and spacious sewing room along with many of the other "newbies" and we all had a great time getting to know each other. ... followed by the addition of top and bottom borders to "Josephine." I reckon you can see I'm an eclectic quiltmaker!! Monday and Tuesday were devoted to the third quilt from leftovers in my Scrumptious collection. 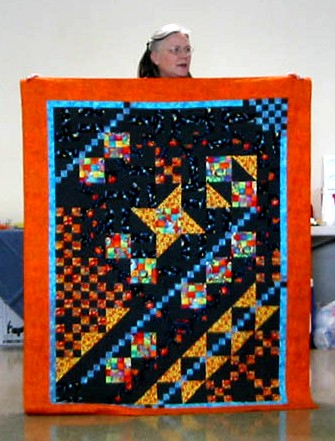 I am using another pattern from 101 Fabulous Rotary-Cut Quilts -- Army Star. It has been a challenge to reverse the values in the pattern, but I really wanted to use the "24th and Vine" border from quilt 2 as the main fabric in Scrumptious III. I had worked out my plan at the last retreat, even made the 3-piece sashing units. Too many sashing units, as it turns out, so I will need to cut and make more stars and broken dishes. Then come up with a plan for borders. OR I could use the extra units for quilt 4 .... NAH! Wednesday was devoted to Dots and Dashes, my many-years-old monkey wrench project. I had kitted up block pieces -- in pairs since I'm making two quilts -- and worked my way from 28 to 43 completed (times 2). I need a minimum of 50 for each, but could use 59 to make them even longer. Since they are neatly packed in Zip-Loc bags, it will be easy to pick up and sew a pair as time permits. At the same time, I tried not to think about the two weeks coming up when my husband will have cataracts removed from both eyes. I know most folks come through with flying colors and can see so much better afterwards, but I'm worried for him, nonetheless. Thankfully SIL will be here to take care of the Queen Mother and I can devote my time to caring for DH. Not sure if there will be much sewing in the next two weeks so I'm glad I met my One Monthly Goal with a week to spare! At another retreat with very limited internet access. No time to check blogs. Will try to give a full report on Friday. The NC mountains are absolutely gorgeous this time of year! Finally found the camera -- on the front seat of the van! The Courthouse Quilt Guild Fall retreat attendance was down a bit from previous years due to health issues (members and/or spouses) and a conflicting retreat. But we didn't let that get in the way of a good time or productivity. This retreat was a little different in that almost everyone concentrated on one or two big projects rather than trying to finish up a bit of this and that. Sit back and enjoy the quilt parade. Nancy and I took this class with Debbie Caffrey quite a few years ago and she finally has her center together. (Mine's been done for a while ;-)) She will add inner and outer borders at home. Nancy followed that with an Elsie Campbell table runner that has been in her UFO pile for a while. Sally worked on several projects. I love these paper-pieced butterflies, all done in spotted bright colors. Ari got a lot more done on her Stems and Stones, but I missed getting a photo. Donna worked on hers, as well, and I missed getting a picture of that, too. Donna has been working on this one over several retreats and finally got the center together. Cathy has recently moved so she just grabbed a couple of project bins as she headed out to retreat. She was surprised that this one was begun in 2010 (at least that was the date on the magazine picture). She came with the blocks/frames completed, but couldn't remember what she had planned for the center of the frames. I suggested she fuse these cute panels in the block centers and it was a huge success. Somehow I missed photographing Ruth's and Susan's projects. But, in all honesty, they both work so fast that I couldn't keep up with them! The border print is from the French General "Josephine" collection, as are most of the charm squares. We accomplished a lot and a good time was had by all. Full disclosure: I'm going to another retreat next week and I just left all my equipment and unfinished projects in the van. I'm ready to rumble!!! Most of my week was taken up with a quilting retreat. It was a small group but what we lacked in quantity, we made up for in quality -- both in the company and the projects completed. I just wish I could remember where I packed the camera so I could give a full report (and show some better pictures). My first order of business at retreat was to put the borders on the baby quilt I had thrown together the week before. My plan to work on Dots and Dashes, the planovers from a long ago charity quilt, went by the wayside when another project took longer than I had anticipated. It's another "down the rabbit hole" story. I was looking for a madder fabric in my bin of strippy/border print fabrics when I unearthed this red one (redder in person). Realizing it was from the French General collection, I pulled out a coordinating charm pack I had been gifted last year. The design genes kicked in and before I knew it I was cutting and stitching away. My plan is to add more of the border print to the top and bottom, but after a day and a half I was ready to move on to something else. More/better pictures when the camera surfaces. Till then, I'm linking up with Cynthia at Quilting is More Fun Than Housework. Does it seem silly to you that Hawaii has interstate highways? No post today. I'm at retreat, having fun, laughing a lot, trying not to eat too many snacks. I know, I know .... I haven't finished even half of what I touched in September, so why am I dragging out yet another Moldie Oldie? These monkey wrench blocks are "planovers" (an old Weight Watchers term) from a top I gave to charity many years ago -- probably pre-2008 since I have no recollection of working on that quilt in this house. I'm not a pastel kinda person. Nor am I a floral kinda person -- at least on fabric. How I accumulated a collection of pastel florals is still a mystery to me! So back in 2007 (or so) I found an idea in 101 Fabulous Rotary Cut Quilts by Judy Hopkins and Nancy Martin that I thought would be a good use for these fabrics (mostly FQs). So, anyway, this is the design I selected -- Double Wrench. I wish I had a photo of the quilt top I gave to the sisters at Mount St. Joseph, a Catholic convent and retreat center in Kentucky. It was so sweet and the on-point arrangement reminded me of a ribbon running through the wrenches. Since at the time I was trying to use up the florals, I went ahead and cut extra sets to make a pair of twin quilts for the antique beds in our guest room (which in that house was painted yellow). And there they sat for 8 years, with almost half the blocks made and another almost-half cut and prepped ... until the middle of last week when I was looking for projects to take to retreat this week. Since it's one of those projects that needs a really big design wall and the upcoming retreat will have plenty of wall space available, these quilts made an appearance. I don't expect to get the tops finished, but I plan to finish the blocks, lay them out, and have the rows ready to put together at home. I'm linking up with Cynthia at Quilting is More Fun Than Housework to share my scrappiness. October is going to be a busy month -- two quilt retreats, breakfast for the church women, and two eye surgeries for my husband at the end of the month. So I'm going to keep my October One Monthly Goal (OMG) simple. Following my plan for the year, I am selecting a UFO that contains the Rainbow Scrap Challenge color of the month -- orange! A simple border and simple quilting will finish this Halloween panel and move it from UFO to DONE. I'm linking up with Heidi at Red Letter Quilts to declare my OMG for October. Pop over there to see what other quilters will be working on this month.